Florida Governor Rick Scott today signed legislation banning texting while driving. Even though the bill restricts makes texting and driving illegal, the new legislation is being called one of the weakest laws in the country. After five years of trying, Florida is now the 41st state with a texting ban. “I’m excited we’ve finally gotten to the point to where the final signature is going on the texting ban,” said (R) District 74 Representative, Doug Holder. 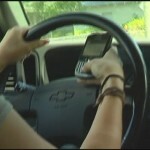 Lawmakers anticipate the new texting ban will prevent accidents. As a secondary offense, police must see another violation to stop a driver. Drivers Ed Instructor Michael Blain says the law won’t have the same effect as a primary violation. “I think it would have been much better if it was a primary offense, allowing police officers to actually actively look for texting while driving,” said Blain. Even though it’s new here, four states have similar laws. One of them, Virginia, is changing its texting and driving from a secondary to a primary offense in July. University of Wisconsin-Milwaukee study shows in the months following a texting and driving ban, the number of accidents go down. But, after a few months, the study shows drivers go back to old habits. Opponents argued the law isn’t needed because it’s already illegal to drive carelessly. Distracted drivers caused more than 4 thousand accidents last year. The texting law will go into effect starting October 1st.